I’VE TRAVELED TO some of the most remote locations across the globe, including the Okavango Delta in Botswana, rainforests in South Vietnam, and the Aleutian Islands off the coast of Alaska, but I’ve never been able to fully escape the presence of man. 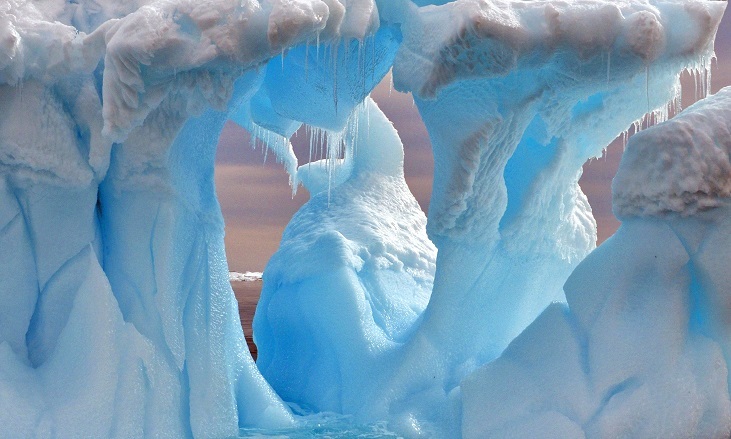 For this reason, the allure of Antarctica as one of the last true wilderness frontiers on Earth was overwhelming. As a biologist visiting the continent, my connection with Antarctica was far deeper than I imagined. While many picture the landscape as barren and lifeless, the reality is that the entire coastline is teeming with birds, seals, whales, fish, and much more. For me, Antarctica was an escape from the fast pace of the society we live in, a glimpse into a world that thrives devoid of human presence, and an eye-opener to the bleak and unrelenting conditions that life must cope with to survive in one of the harshest environments on the planet. All photos by Max Seigal — all rights reserved. 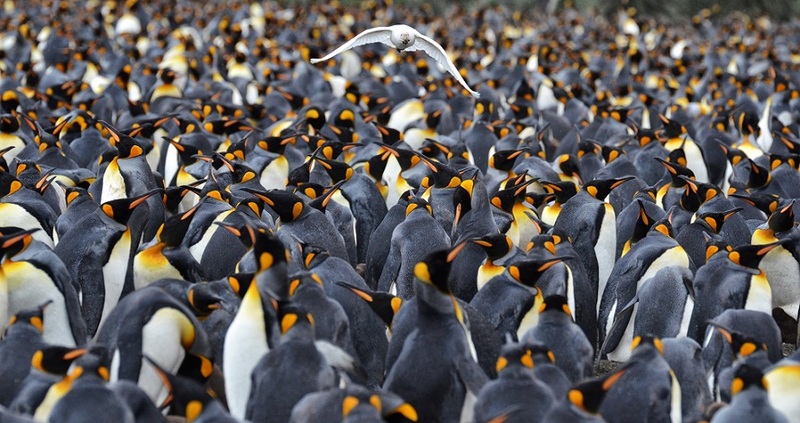 A Snowy Sheathbill takes flight amidst a crowd of King Penguins on South Georgia. Snowy Sheathbills make a living by scavenging fish and krill, but will sometimes eat penguin eggs or their down-covered chicks. 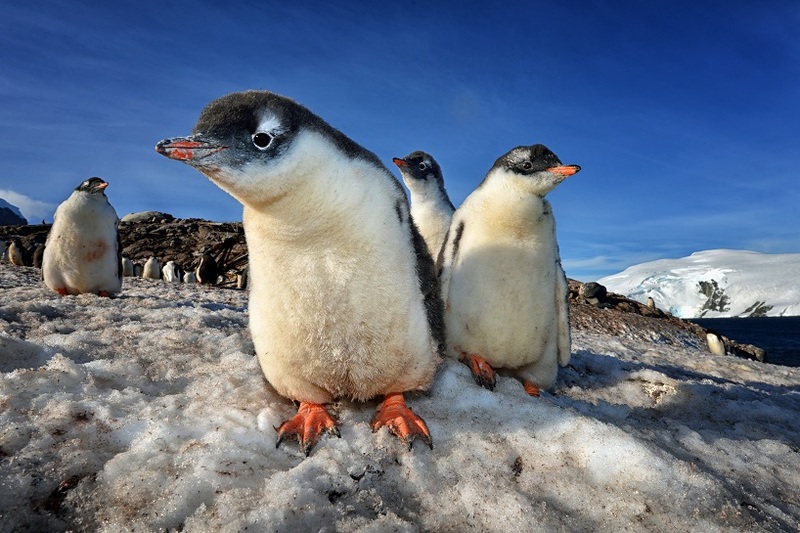 After my morning photographing a Gentoo Penguin colony, these curious chicks approached me. Full-grown adults stand at just over two feet tall, so I spent the day on hands and knees capturing images from their perspective. 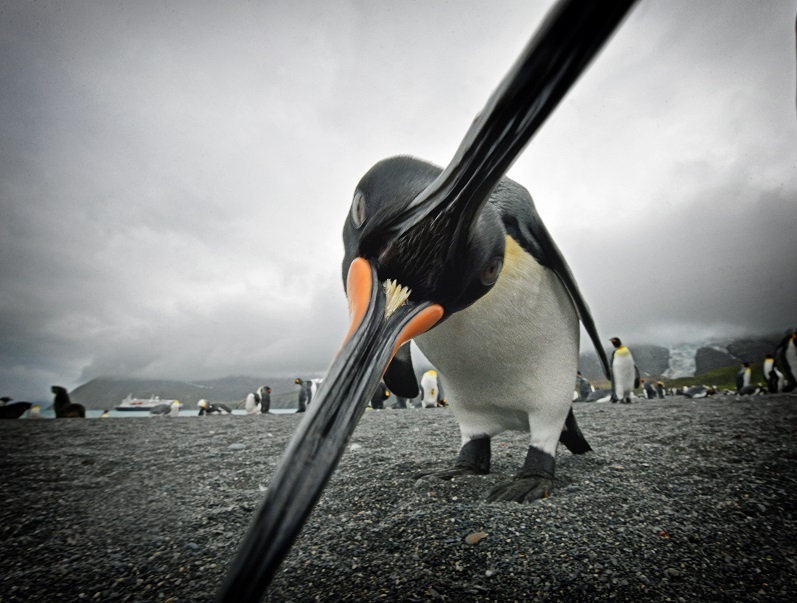 King Penguins can be very curious and tend to peck at anything that strikes their interest. Sitting down and waiting patiently proved to be rewarding -- several Kings approached me and started pecking at my boots, my pants, and even my camera lens! I set out early one morning to capture sunrise shots on South Georgia Island, but was met with overcast skies. To make the best of the situation, I changed my camera settings and decided to capture long exposures of penguins in their habitat. 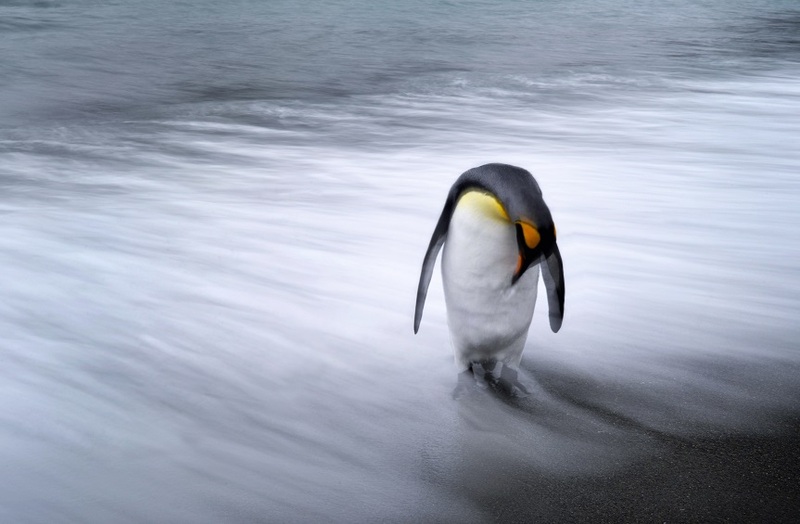 While King Penguins are typically seen in crowds, this lone penguin emerged from the sea and started preening itself, providing the perfect opportunity for this shot. This was one of the most unique icebergs we ran across in Antarctica. It was close to the shore and, while most other bergs were rounded, circular, or rectangular in shape, this one had been pounded by waves, making it hollow. It originated from a nearby glacier, which differentiates it from other bergs in the area that are formed when sea water freezes. The deep blue colors are a result of the centuries of pressure the ice experienced as part of the glacier. This pressure compacted the ice, forcing out tiny air bubbles and making it extremely dense, which leads to darker and more vibrate blues when light passes through. 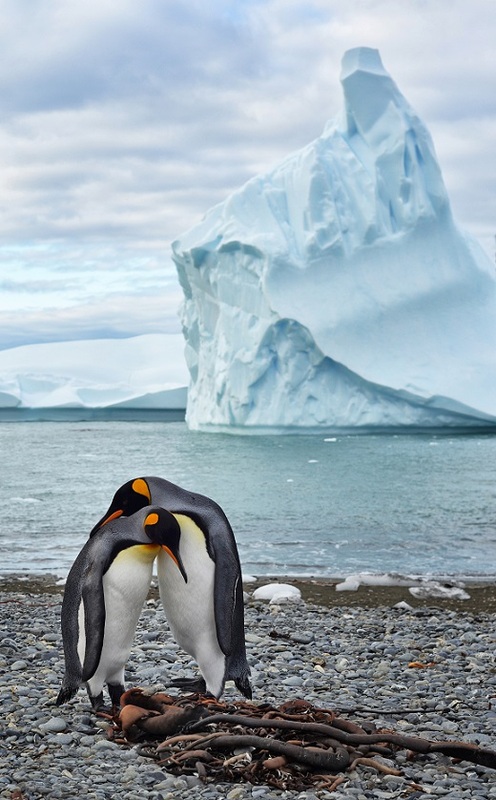 King Penguins have extremely fascinating courting rituals. They are considered "serially monogamous," meaning they have only one mate per year and stay faithful to that mate, but between years, they typically find new mates. These two birds were displaying affection for one another, and as long as another male doesn't compete for this female, it is likely that the two will have an egg and share incubation responsibilities for the 55 days before it hatches. 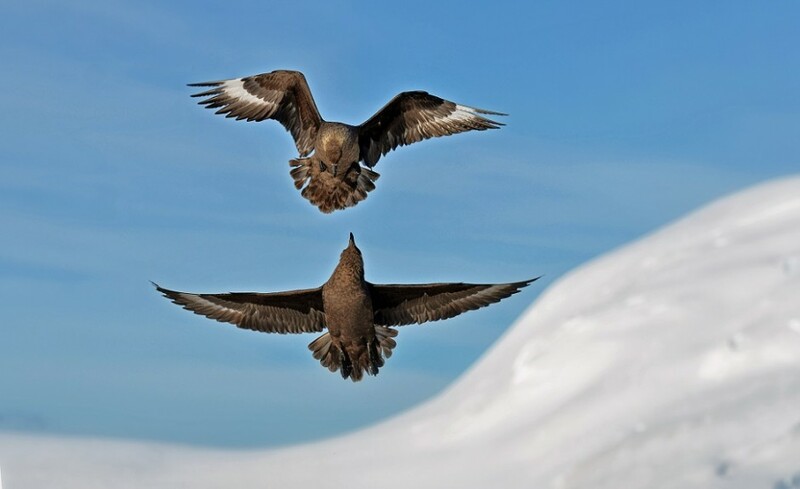 Skuas are extremely intelligent birds. They often work in collaborative teams to catch penguin chicks. One skua will approach an adult penguin from behind, pecking at its back. When the penguin looks defensively behind it, another skua swoops down to steal the chick from right under the parent's brood pouch. This is exactly how this scene unfolded, but once these two skuas had finished their meal, they began fighting one another. During the late summer months in Antarctica, the sun will set for only a few hours a day. Due to the low angle of the sun over the horizon, the colors of sunset can last for hours. 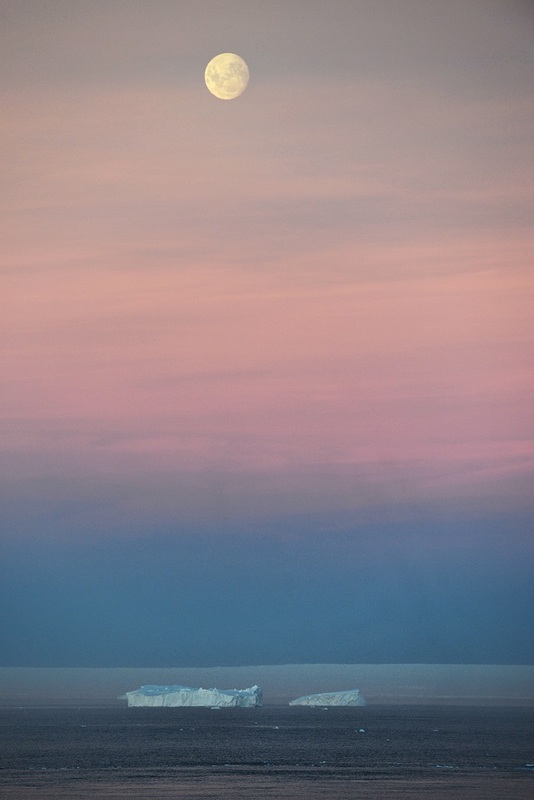 This night was particularly memorable as the moon rose above distant icebergs just after the sun sank below the horizon. Fur seals are extremely agile and have a startling turn of speed. A first encounter with fur seals can be alarming because of their aggressive grunting noises, followed by a charge and a lunge display that looks like an all-out attack. More often than not, these are just territorial displays and rarely result in any physical contact. 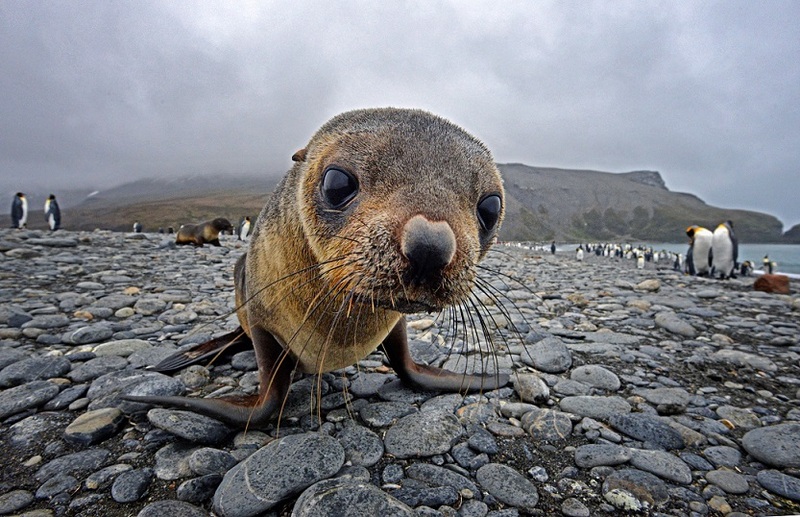 Young seal pups quickly learn from their parents and will mock charge anything that moves, in this case the camera in my hand. The Drake Sea is one of the roughest patches of ocean in the world, and is the only way to gain access to Antarctica from the southern tip of Argentina. With regular storms rolling through and 50-foot waves that make even the biggest of ships thrash about helplessly in the wide-open ocean, the most weathered seamen still fear the Drake. 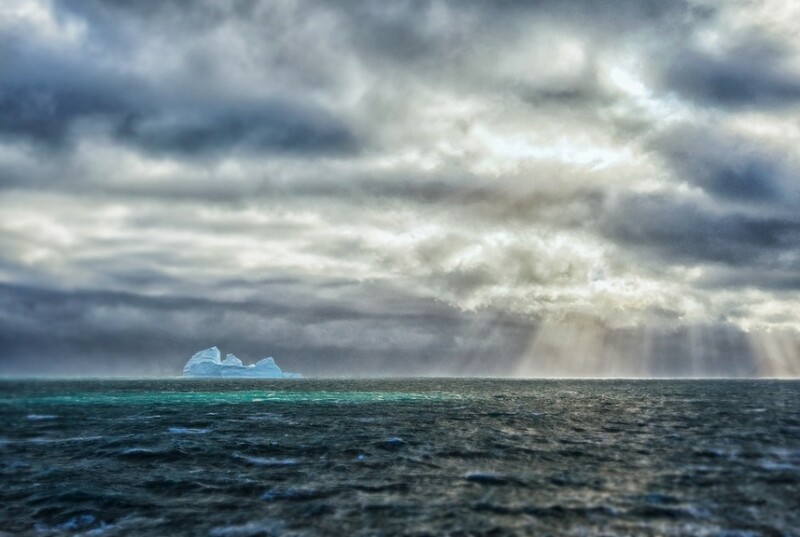 During our crossing, we were hit with gale-force winds and powerful waves, but as the storm let up and the winds began to die, the sun peeked through the clouds, scattering beams of light across the ocean and surrounding icebergs. In this ephemeral moment, we knew the worst was over and we had made the rite of passage to Antarctica.